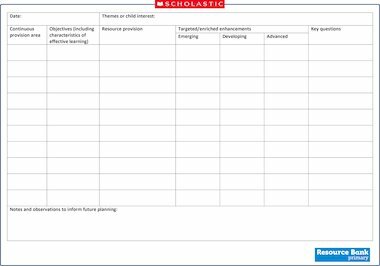 Our continuous provision planning templates take two forms to suit your needs. This first template allows you to plan multiple areas on one page, while the second template enables you to plan for one area over a week, where you intend to change the provision daily. Both templates are suitable for both indoor and outdoor provision planning. Objectives and an overarching description of the provision can be outlined for each area. Space is provided to plan for enhancements at different levels (emerging, developing and advanced) to ensure that your entire cohort is challenged at their point in the learning journey. The lower section of the template allows for forward planning based on observations and outcomes.